Victoria (VIC) is a state located in south-eastern corner of Australia. With Melbourne being the coastal capital of Victoria, located on Port Phillip Bay. Over the past decade, Victorian pubs and bars have seen massive changes as the evolution of craft beer has moved across the state. Not that long ago, when times and tastes were simpler. Most venues only stocked four (macro) draught beers, and a few dozen styles of bottles and cans. Fast forward to today, and Vic drinkers are spoilt for choice, with almost 100 x craft beer destinations spread across the state. 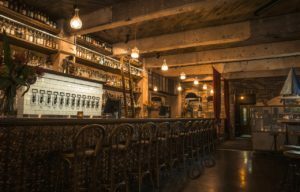 Whether they be intimate Japanese robot small bars, massive brew halls, suburban breweries, or quirky whisky-craft-beer-charcuterie bars – Melbourne..nay Victoria has you covered. Add to this Melbourne’s eclectic dining scene, with a startling array of the world’s great cuisines. From popular favourites, to the truly groundbreaking. With Melbourne, you’re definitely onto a winner.